As an intro activity to my English 10 class’ first major reading, Tuesdays with Morrie, I wanted to talk about ALS (amyotrophic lateral sclerosis or Lou Gehrig’s disease) and the complications of that disease since the main character, Morrie, struggles with ALS. Today’s lesson was focused on introducing Tuesdays with Morrie–the message, purpose, themes, and characters. [You can find my hand-written planning sheets here: pg 1, pg 2]. 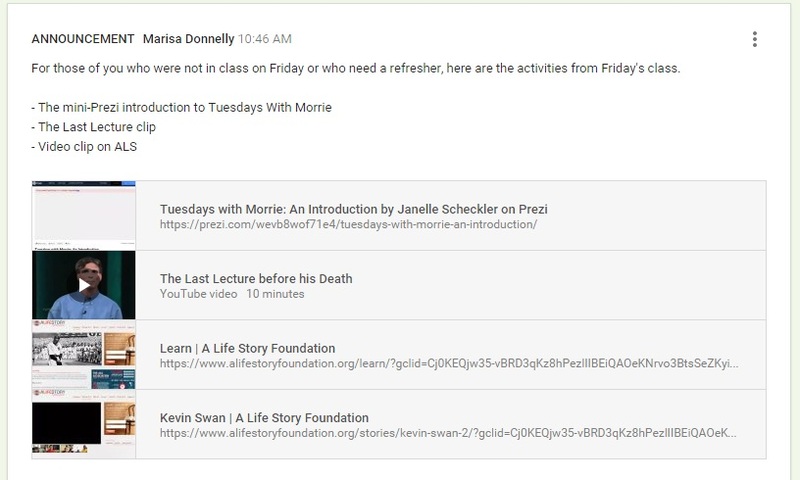 I started with a short Prezi I found online, Tuesdays with Morrie: An Introduction by Janelle Scheckler. This was a very simple Prezi, but great to open discussion about major themes as well as the mood and tone, which I knew I would go over again and again as we moved forward in our reading. A sample slide from Schlecker’s Prezi. After the Prezi, which led right into Randy Pausch’s The Last Lecture, I had the students watch the short clip and take notes. I created a note guide that grabbed some of the best and most relevant points from the video to connect it to what we would read within the next few days. I gave the students the option to listen and take notes later or to take notes during the video. After watching, I let them work independently for a few minutes to fill the questions in, and then I gave them a few minutes to work with partners to fill out any missing questions before moving to whole-group discussion. The awesome Last Lecture video is below. This note sheet was one way I adapted my teaching methods. Instead of just talking about ALS/dealing with death, I used the video and the actual words of Randy Pausch to connect directly to each of my students and give them a more personal story. Using the video was just one of my tools of inquiry used to change my teaching and make it different and meaningful. After we discussed the notes, I embarrassed myself by showing my Ice Bucket Challenge video: click here to watch. We also watched another short clip on ALS, this a personal story of Kevin Swan. This was extremely heart-wrenching, especially to see Swan struggle with some of the most simplest tasks, like putting on a shirt. However, this video really helped to give the students a sense of the quick and devastating results of this disease.